Things have always changed: i write today in Chichester, my hometown, an old Roman city, which became the capital of the Kingdom of Sussex. From marching fort and Roman camp, to fortified town and city state. Today, as part of the UK, it still houses a grand 12th century cathedral, and serves as a centre of religious organisation, as a diocese. Surrounded by farmland, the landscape itself of the South Downs is a grazed chalk pasture, shaped by agriculture, but not immune to the collectivism and nationalism of all farms, bought up and consolidated. 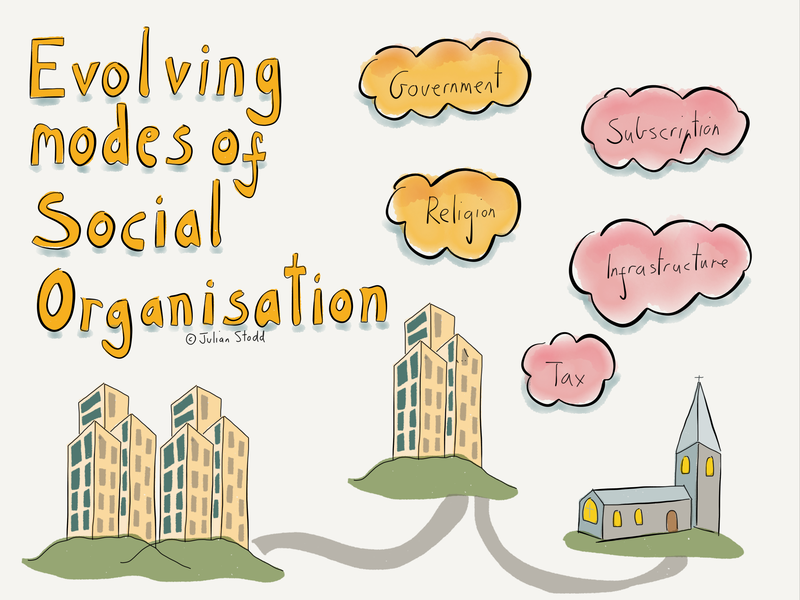 Modes of social organisation have always evolved, and we are in the midst of the expansion, experimentation, and evolution of models as we speak. I’m fascinated by the evolution of democracy, nested in the notion of ‘nation’, a notion based largely in historical precedent (factors of conquest and marriage), transport infrastructure (hence trade routes), and communication (hence cultural spread). Government serves the nation, to provide for all, to organise, to strategise, to hold us safe. Or some such platitude and nicety. But neither the notion of nation, nor the conception of government that we employ today, are fixed or everlasting. I wrote yesterday on the rise of the Transnationals, the emergence of (as yet ungrounded) new trade structures, empires of influence, shapers of culture, globally. The pioneers of the digital space have firmly re-grounded themselves in culture, but not geographically defined culture, rather subscription based. I’ve been following one train of thought around this: governments exist in one nation, provide infrastructure, and levy taxes. Infrastructure was vast, complex, expensive, and beyond the individual. There were some variants in this: in the UK, the rail network, the canal network, indeed, most of the national road network, and many bridges, started as private enterprises, toll based, but were gradually consolidated, standardised, rationalised (not that you would know it from navigating the London Underground). Today, though, the picture is changing: it’s Tesla providing power in western Australia, offering to install a power grid in disaster struck Puerto Rico. It’s Amazon and it’s ilk that will create drone infrastructure, leapfrogging road or rail in Africa. It’s connected devices from Apple and running Android that will embed the connected network of health sensors heralding the move to continuous health (rather than emergency based reactive systems, such as the NHS). Government provides infrastructure and levies tax: the transnationals provide cultural and logistical infrastructure, and levy subscription, but i’m not sure the two are entirely separable. The difference may simply be in where they are grounded. And there are further differences: governments wield firmly hierarchical power, whilst the power of the Transnationals is more deeply consensual, and more socially accountable. Governments are nationally centralised, whilst Transnationals are geographically dispersed and, in any case, digitally based. We have not yet fully seen the Transnationals reground their power in the physical domain, at least not at scale, and we have not seen widespread attempts to demonstrate geopolitical influence, at least not substantially beyond tax and trade. But we will. When it’s reported the Bitcoin uses more energy than Bolivia, when Apple and Google start defending ‘citizen’ rights against an intractably xenophobic ‘government’, when people start to identify as brand aligned more than geographically aligned, the scales might tip. What if Netflix denies service to Virginia? There may be no aspiration to power, but power can be imposed: we may end up embedded in new modes of social organisation not because we crave it, but simply because we have subscribed to it. And maybe that is no bad thing. One train of thought i’ve been following is this: our two largest analogies of social systems at scale are governments (nations), and organised religions, neither of which are noted for changing and adapting to evolved social mores at speed. Just look at how long the battle for equality is taking, and look at how hard it is to accept the plainly true: i was disappointed to hear the new Bishop for London refuse to answer the question “is homosexuality a sin” on her ordination last month. It’s inexplicable to me that the head of the anglican church, in the capital city, of a supposedly cosmopolitan and contemporary nation, is unable to address such fundamental questions. Sure: i understand that that the church desires time to reconcile it’s differences, but in the Social Age, these changes do not take decades. Both nations, and religions, may simply be superseded by more relevant models: ones that are more synchronously connected to dominant social reality. There’s another feature that’s fascinating: i wonder if the radical social engagement we see with key celebrities is, in fact, a quasi religious manifestation. A new religion. We know that we are evolutionarily predisposed towards belief: we have an innate desire to invest something of our hopes and dreams, and to mitigate our fears, in a ‘meta’ being. Perhaps, in the Social Age, that divinity is Beyonce. The route to a hundred million followers may simply be a matter of subscription, but the messaging is synchronous, and the engagement is high. Perhaps. The challenge for governments is to adapt: to move from asynchronous, and utility based approaches, towards more empowering, collaborative, and continuously engaged models. No matter how much i care, there is simply no existing mechanism for me to invest my cognitive surplus in government today, beyond emailing my local MP. And he is an idiot, so i’m unlikely to try that. This is not about relinquishing control so much as moving from partisan, party based, asynchronous models, towards collaborative, responsive, and agency based approaches. Government by the people, for the people. By the people. This entry was posted in Culture, Social Age and tagged apple, Change, Democracy, Google, Government, Healthcare, Leadership, Nation, Power, Religion, Tesla. Bookmark the permalink. Or perhaps the divinity is Oprah. In fact, I wonder if the executive role in the U.S. is shifting in such a way that the primary qualifications for president will be a rabid following cultivated through a media presence. The president might end up more as a figurehead who can incite or inspire. Her success will lie in how positive an energy she can inspire in the country and how effectively she chooses her team.